Sense of vision and hearing are crucial for learning. When one of these is defective, dependence on the other one is increased. A deaf child needs to depend more on vision to explore his world. If such a child has some visual impairment (VI), it significantly affects development of communication skills and ability to explore the world around. Such children with visual disorders and deafness may require multiple environmental adaptations and appropriate support. Deafblindness is not just the sum of deafness and blindness; it is a unique and entirely different condition. To estimate the associated risk factors for the same. This cross-sectional study was conducted in 12 special schools for HI children in Guntur district of Indian state of Andhra Pradesh [Figure 1]. Eleven of these schools are run by different nongovernmental organizations and one is run by the state government. The Institutional Review Board approved the study, and the study adhered to the Tenets of the Declaration of Helsinki. Appropriate approvals were also obtained from the local district authorities and school authorities. All children between 6 and 16 years of age in the special schools, available for examination, were included. Those who were above 16 years of age, not willing to participate in the study, not cooperative, and those who were not available at the time of examination were excluded. The study team consisted of one ophthalmologist, two ophthalmic officers, and one program manager. All the team members were briefed about the study protocol. Ophthalmic officers were trained to collect requisite data from parents and school authorities, to measure height and weight, and to conduct visual acuity (VA) testing, refraction, and basic torch light eye examination. They were also trained to identify common eye problems in children, such as squint, cataract, nystagmus, ptosis, and identify gross systemic abnormalities. Interobserver variation test was done by the ophthalmic officers on 20 subjects for VA and refraction, and the overall agreement was more than 0.6. A questionnaire was designed, piloted on 20 subjects, and standardized. It consisted of demographic data, particulars regarding HI (mild/moderate/sever/profound), anthropometric measurements such as height and weight, history of systemic diseases, and details of comprehensive eye examination. For definition of VI, as per World Health Organization (WHO), VA of better eye was considered. Mild VI was defined as presenting VA less than 6/12 to 6/18, moderate VI as less than 6/18 to 6/60, severe VI as less than 6/60 to 3/60, and blindness as less than 3/60. Those having VA of less than 6/12 in either eye and improving with refractive error correction to 6/12 or better were considered to have refractive error. Myopia was defined as a spherical equivalent refractive error of at least −0.50 D and hyperopia as +2.00 D or more and astigmatism as cylindrical correction of more than or equal to ±0.75 D. Cataract was defined as clouding that develops in the crystalline lens as seen in pupillary area. HI was classified as mild, moderate, severe, and profound as per WHO definitions. It was also classified as congenital HI when it was diagnosed within 1 year of birth and acquired when it was identified later. Primary education was defined as those having education from grade 1 to 4, secondary education as grade 5 to 10, and higher education as ≥grade 11 and above. Consanguinity was defined as marriage between first, second, and third cousins. Initially, the demographic data, details of cause, and severity of hearing loss were noted as per history from parents, teachers, and records available with the school about each child. The students were examined in the presence of their teacher who helped with communication through sign language. History was obtained from every child along the following lines: any defective vision, history of wearing glasses, any problems with night vision, and so on. A systemic examination was performed to look for any systemic illness such as developmental delay, skeletal deformities, and any other associated disabilities. The height and weight of every child were measured. VA was assessed using a log minimum angle of resolution (MAR) type “E” chart with five E optotypes on each line (Precision Vision, La Salle, IL, USA) and recorded as the smallest line read with one or no errors at 6 m. The student had to orient his fingers to match with the direction of arms of E on the chart. Each eye would be tested separately. The right eye was tested first and then the left, both with (presenting VA) and without glasses (uncorrected VA), if the child brought them. Lens power was measured with a lensometer. An enquiry will be made whether they use glasses regularly and if not what is the reason for the same. Ocular motility examination was performed with cover–uncover and alternate cover test at both 0.33 and 6.0 m. Tropias were categorized as esotropia, exotropia, or vertical, with the degree of tropia measured using the corneal light reflex. Pupil in each eye was dilated with 1 drop of 1% cyclopentolate, followed by 1 drop of tropicamide 1% + phenylephrine 5% combination after 10 min, and cyclopentolate 1% will be repeated after 10 minutes. Light reflex and pupil dilation were evaluated after an additional 15 min. Cycloplegia was considered complete if the pupil was dilated to 6 mm or more and light reflex being absent. Refraction was performed in children after cycloplegia, regardless of their VA, using streak retinoscopy. Subjective refraction was performed in children with uncorrected VA of 6/12 or worse in either eye. The ophthalmologist evaluated the anterior segment using a torch light and fundus using an indirect ophthalmoscope. Diagnosis of pigmentary retinopathy and other posterior segment pathologies were based on the clinical judgment of ophthalmologist. Children whose vision improved with refractive error correction in either eye were prescribed spectacles, and those children requiring subspecialty care or rehabilitation services were referred to the nearest tertiary care center. The findings were noted in the data collection form at the end for all children. Following data collection, each data form was checked for completion and accuracy, and subsequently, fed into a database. Stata 13 was used to statistically analyze the data. Continuous variables were analyzed using Student's t-test. Categorical variables were analyzed using Chi-square test. Logistic regression was used for univariate and multivariate analyses to examine risk factors for VI. Hosmer–Lemeshow test was applied to assess the model fitness. A two-sided P value <0.05 was considered to be statistically significant. A total of 402 children with HI, from 12 special schools, were examined. The mean age for these children was 11.5 years [standard deviation (SD): 3.3 years]. The mean height was 139.4 cm (SD: 20.3 cm), and the mean weight was 33.4 kg (SD: 13.2 kg). The height and weight of all children were normal for their age except a 14-year-old girl who was dwarf (90 cm). The demographic data of these 402 children are shown in [Table 1]. More than 60% of children were between 11 and 16 years of age, and there was male preponderance (59.5%). The parents of a majority of the children were either illiterate or with a primary level of education (72.9% of the mothers and 56.2% of the fathers) and had consanguineous marriages (64.2%). Most of them were having either severe or profound HI (67%), and the most common cause of HI was hereditary (95.3%) [Table 1]. In all, 26 (6.5%) children were intellectually challenged and 3 children had dysmorphic facial features. One had cleft lip and cleft palate (surgery done), and one child had no auditory canals in either of his ears. Of the 402 HI school children, 64 were found to have one or more ophthalmic abnormalities. Thus, the prevalence of ophthalmic disorders was 15.9% [95% confidence interval (CI) 14.9%–16.8%]. The most common ophthalmic disorder was refractive error seen in 29 children (7.2%) followed by retinitis pigmentosa (RP) seen in 16 children (4%). Seven of these children with RP had associated refractive error. Squint was seen in eight children (2%), and one of these also had associated refractive error. Other abnormalities included lid abnormality (one), corneal opacity (one), vitamin A deficiency (one), cataract (four), glaucoma (one), retinal detachment (one), optic atrophy (three), macular pathology (five), microphthalmos (one), and microcornea (one). In all, 35 (54.7%) of the abnormalities were either preventable or treatable. Ophthalmic abnormalities were more common in children whose parents had consanguineous marriages (64.2%) than those who did not have consanguineous marriages (35.8%; P < 0.0001). Of the total 402 children, 29 were found to have VI as per WHO definition (presenting vision <6/12 in better eye). Thus, the prevalence of VI in our study was 7.2% (95% CI 4.9%–10.2%). Twenty-one of them had mild to moderate VI (presenting VA 6/12–6/60 in better eye) and eight had severe VI (presenting VA less than 6/60 in better eye). Of these 29 children, only 7 (24.1%) were known to have eye problems earlier and 22 (75.9%) were newly found during the study. Refractive error was the most common cause of VI and was seen in 18 children, followed by RP (five) cataract (two), glaucoma (one), macular pathology (one), microcornea (one), and optic atrophy (one). Twenty of them (69%) with VI in this study group were treatable. 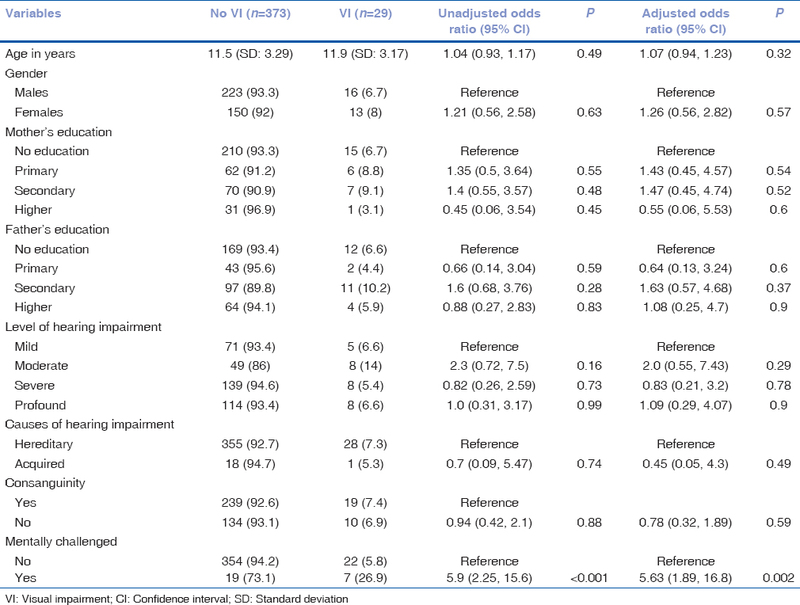 [Table 2] shows the univariable and multivariable analyses for risk factors for VI. Only those who were mentally challenged were at higher odds of having VI (odds ratio: 5.63; 95% CI 1.89–16.8). Treacher Collins syndrome More Details: one case (lid coloboma, microtia, atresia of external auditory canals, hypoplastic mid-face, malformed mandible). Overall, this study found the prevalence of ophthalmic disorders to be 15.9%, and nearly 55% of them were avoidable. [Table 3] shows the prevalence of various ophthalmic disorders in different studies across the globe done at different points in time. Only one study was reported from India, and the prevalence of ophthalmic disorders found in our study was lower when compared with this study from India by Gogate P et al. They found that there were 24% children with various ophthalmic disorders. The major difference in the two studies was in the prevalence of refractive errors. They found refractive errors in 18.5% of the children, whereas we found it in 7.2% of them. This difference could be because of urban–rural difference between the study population, that is, ours was rural and theirs was urban. Such a difference in the prevalence of refractive errors between urban and rural populations is well-known., Apart from that, it is likely that children with reasonably good vision are likely to be admitted in schools for HI. Those with severe VI or having other multiple disabilities are likely to be either at home or in other special institutions. This could be another reason for less prevalence of refractive errors and VI in our study. However, compared with GogateP et al. 's study, we had higher prevalence of RP (Usher's syndrome). This could be because of consanguineous marriages being more frequent in this population (64.2%). Similarly, the difference in prevalence between different studies could also be explained by the difference in methodology in different studies, different definitions, population, and the time period these studies were conducted. The prevalence of VI in this group of children was found to be 7.2%. Approximately more than 75% of this VI was undetected so far. It is also important to note that nearly 70% of VI was treatable. Most of these children underwent an eye examination for the first time, and prior to our visit, none of these schools had any eye-screening program. Prevalence of VI (presenting VA <6/12) in children in general population in different Indian studies has been found to be ranging from 2.6% to 4.9%.,, In our study, the prevalence of VI was 7.2%, which was a bit higher. This shows that VI is more prevalent in HI school children. Apart from this, nearly 75% of eye problems were newly diagnosed indicating lack of screening programs or ophthalmic examination for these children. Hence, there is a need for a regular eye examination program in schools for children with HI as most of these children rely entirely on their visual system for learning and having visually handicap, making the situation worse for them. This is further aggravated for unavoidable causes as they would need multiple interventions as well as various kinds of support services, including rehabilitation services. Hence, there is a need to sensitize the caretakers, that is, parents and teachers. There is also need for genetic counseling and social awareness about the risk involved to children born from consanguineous marriages as there were more chances of having ophthalmic abnormalities and other systemic abnormalities in those children born from consanguineous marriages. Most of these children also have syndromic association and other ocular pathology. We could find multiple cases of syndromic associations, and some of them were mentally challenged too. Also, being mentally challenged was found to be independent risk factor for being VI. The presence of VI in these children will add to their agony, and hence, a through systemic work-up along with comprehensive eye examination, preferably by a pediatric ophthalmologist, is recommended. One limitation of the study was uniform method of vision assessment rather than using different methods for children with other disabilities. However, with support from teachers, vision assessment could be done in all these children. Another limitation was lack of any diagnostic procedure performed on these children, especially electroretinogram due to high prevalence of Usher's syndrome in this group of children. The prevalence of ophthalmic abnormalities in HI school children is more compared with children with normal hearing. However, there is need for more studies in the same region in children with normal hearing. Most of these abnormalities remain undetected since the frequency of eye screening in these schools is either very low or absent. Hence, we recommend that regular eye examination should be performed in such schools. Since the prevalence of posterior segment disorders in children is high, it may be preferable that such examinations are performed in the presence of an ophthalmologist. The authors are thankful to the Hyderabad Eye Research Foundation and Gullapalli Pratibha Rao International Centre for Advancement in Rural Eye Care for assistance in conducting this study. They are also grateful to the authorities of schools for the deaf in Guntur district for their cooperation. Hyderabad Eye Research Foundation and Hyderabad Eye Institute. Fillman RD, Leguire LE, Rogers GL, Bremer DL, Fellows RR. Screening for vision problems, including Usher's syndrome, among hearing impaired students. Am Ann Deaf 1987;132:194-8. Nikolopoulos TP, Lioumi D, Stamataki S, O'Donoghue GM. Evidence-based overview of ophthalmic disorders in deaf children: A literature update. Otol Neurotology 2006;27(Suppl. 1): S1-24, discussion S0. Alexander JC. Ocular abnormalities among congenitally deaf children. Can J Ophthalmol 1973;8:428-33. Brinks MV, Murphey WH, Cardwell W, Otos M, Weleber RG. Ophthalmologic screening of deaf students in Oregon. J Pediatr Ophthalmol Strabismus 2001;38:11-5. Elango S, Reddy TN, Shriwas SR. Ocular abnormalities in children from a Malaysian school for the deaf. Ann Trop Paediatr 1994;14:149-52. Gogate P, Rishikeshi N, Mehata R, Ranade S, Kharat J, Deshpande M. Visual impairment in the hearing impaired students. Indian J Ophthalmol 2009;57:451-3. Guy R, Nicholson J, Pannu SS, Holden R. A clinical evaluation of ophthalmic assessment in children with sensori-neural deafness. Child Care Health Dev 2003;29:377-84. Leguire LE, Fillman RD, Fishman DR, Bremer DL, Rogers GL. A prospective study of ocular abnormalities in hearing impaired and deaf students. Ear Nose Throat J 1992;71:643-6, 51. Luhr JP, Dayton KK. Combining clinical and educational services. Am Ann Deaf 1971;116:566-8. Mohindra I. Vision profile of deaf children. Am J Optom Physiol Opt 1976;53:412-9. Pollard G, Neumaier R. Vision characteristics of deaf students. Am J Optom Physiol Opt 1974;51:839-46. Quinsland LK, Caccamise F, Johnson DD. 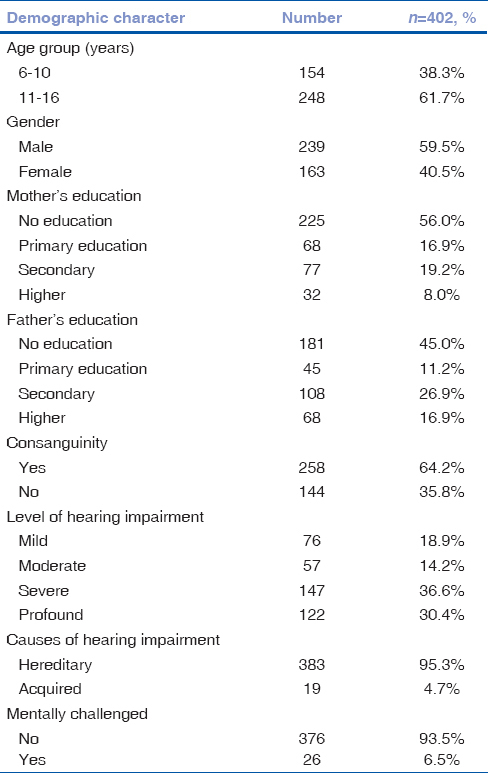 Identification of visual impairments among hearing-impaired persons and implications for educational programs – A preliminary report. Am Ann Deaf 1978;123:406-16. Regenbogen L, Godel V. Ocular deficiencies in deaf children. J Pediatr Ophthalmol Strabismus 1985;22:231-3. Stockwell E. Visual defects in the deaf child. AMA Arch Ophthalmol 1952;48:428-32. Woodruff ME. Differential effects of various causes of deafness on the eyes, refractive errors, and vision of children. Am J Optom Physiol Opt 1986;63:668-75. Available from: http://www.who.int/healthinfo/statistics/bod_hearingloss.pdf. [Last accessed on 2018 Jun 2]. Dandona R, Dandona L, Srinivas M, Sahare P, Narsaiah S, Muñoz SR, et al. Refractive error in children in a rural population in India. Investig Ophthalmol Vis Sci 2002;43:615-22. Murthy GV, Gupta SK, Ellwein LB, Muñoz SR, Pokharel GP, Sanga L, et al. Refractive error in children in an urban population in New Delhi. Investig Ophthalmol Vis Sci 2002;43:623-31. Dandona R, Dandona L, Srinivas M, Giridhar P, McCarty CA, Rao GN. 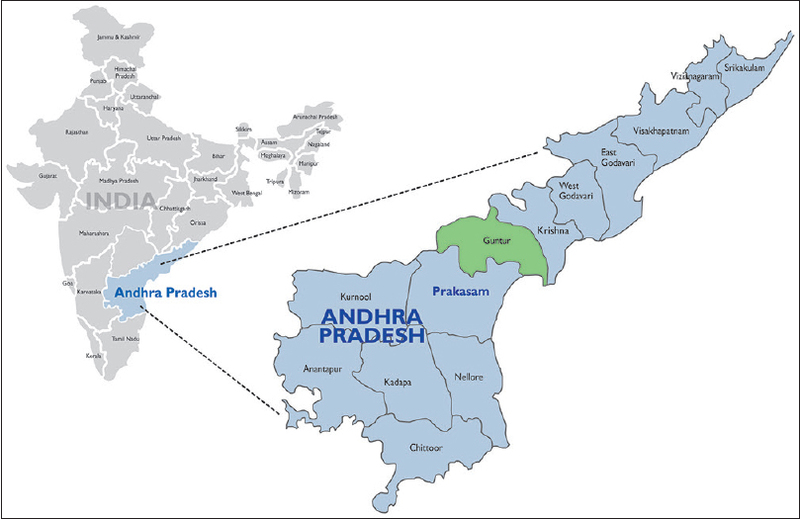 Population-based assessment of refractive error in India: The Andhra Pradesh eye disease study. Clin Exp Ophthalmol 2002;30:84-93.